How do you know what to look for in portable room dividers? This video will explain the features and benefits of Screenflex. Video transcript included. 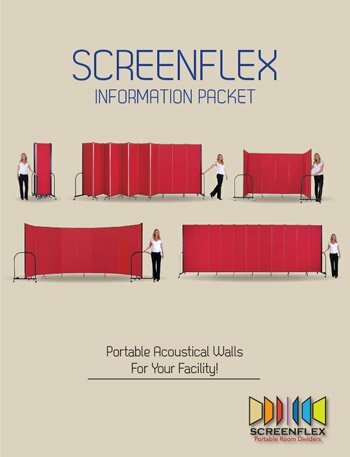 It is likely that this is the first and hopefully only time you will have to research portable room dividers for your organization. Since most of the pictures on the sites look the same, you may be asking yourself how in the world am I to know what to look for. This small checklist should be helpful to you. Besides the ease of movement and operation, safety and stability are key features customers desire. When we ask people what is the most stable object you can think of, we commonly get two answers. The Egyptian pyramids or a mountain. Both of these get their stability from the fact that they are narrow on the top and wide at the bottom. The greatest width and weight is at the base to prevent them from being top heavy. The Screenflex end support is designed in this exact same fashion to provide maximum stability and maximum vision when moving the divider. In addition, the corner casters do not adjust to the uneven areas of your floor. Accordingly, self-leveling casters are a very desirable feature as our properly spaced dual casters on the interior panels. There is a variety of ways to connect panels together. Ask yourself what will last longer, a system with many connecting points between panels or a system with not many at all. Screenflex panels are connected every four inches along their entire length for maximum stability. To help ensure the stability of a portable room divider, a device is affixed with a top of each panel to help lock it in place when in use. acoustical fire rated panels are an important feature as well. If you ask for a fire test, ensure you are getting test results from the entire panel system, not just the fabric. A chain is only as strong as its weakest link. Customers often want to know what part of a portable room divider gets the most stress. First, the point where the end supports intersect with the panels gets all the twisting turning stress from the divider is being pulled or pushed from place to place. Thus, a strong continuous connection screwed from two directions in conjunction with gusset plates at this intersection is absolutely critical to the divider having a long useful life. Secondly, since the caster system is actually what is in contact with the floor it is best to have a caster system which includes a means to read the floor. So the caster system remains level regardless of how bad the floor conditions may be. A well-built caster should also have a strong solid wheel and a fixed steel stem. Any well-built divider should include a strong easy to use locking system and be backed with a company with a great reputation that offers a wide variety of room dividers for you to choose from. When it is all said and done, most customers are looking to get a long useful life from their divider and great value for their organization’s dollar. 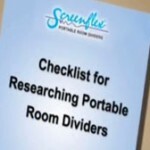 Now you have a checklist of what most folks are looking for in a portable room divider. Good luck in your search. Now that you’ve seen the video, explore our superior designed Standard Room Divider Features.